Before the more hard-hitting, real-world PUNISHER MAX series written by PREACHER's Garth Ennis came his more burlesque stab at the PUNISHER which occasionally incorporated the Marvel Universe. But in several stories here you could see him testing the waters for a broader and more poignant approach to how humanity treats itself. 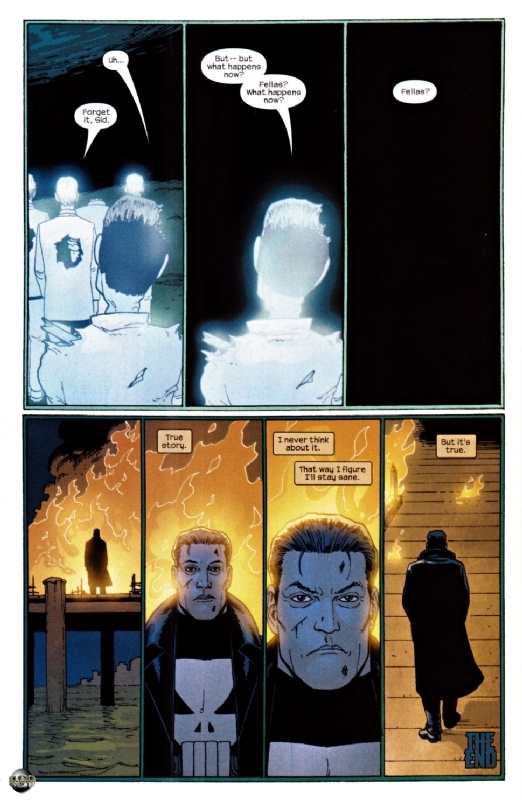 'Do Not Fall In New York City (Noone's Going To Catch You When You Do)', for example, lucidly demarcates the limits of U.S. social compassion, whilst Dillon's solo outing, as part of Marvel's silent month, is all the more impressive because I was completely oblivious to its deliberate wordlessness until halfway through. PREACHER's Steve Dillon: quite the master storyteller. Much to my surprise I found several ancient paragraphs like the above in our vaults on the original, thinner volumes which this collects and I reproduce edited highlights here with apologies for their scattershot nature. Punisher: Business As Usual was an aptly titled third volume of Ennis' take on the implacable crime cruncher whose perpetual, straight-faced impassivity, especially under Dillon's pen line, is all part of the humour. 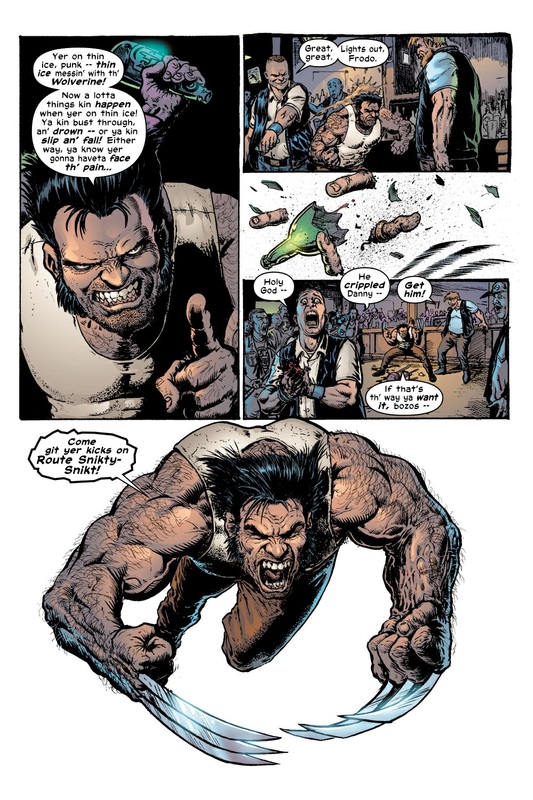 For those who care - amongst whom I do not count myself - Wolverine guest stars in a two-parter, but the recent Northern Ireland issue, grimly concise, rounded off the volume on a high if hardly up-tempo note, with something to say and something well said. Punisher Streets of Laredo took the Punisher out West for some old fashioned shootin' with a new fangled sheriff who's just lost his boyfriend to a bunch of militia. 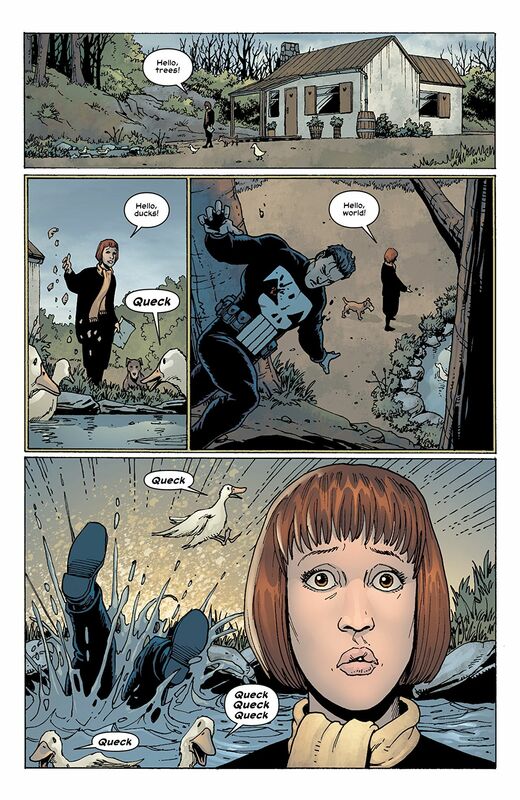 The best single story was drawn by Steve Dillon in which Frank drops in - unexpectedly and much the worse for wear - on the sweet, timid and doting Joan who used to bake him cookies then sigh herself to love-stricken sleep back in MARVEL KNIGHTS PUNISHER VOL 1 . Unfortunately out-of-commission Frank Castle is being pursued by some less-than-savouries, so it's up to Joan instead to fend them off as best she can. Steve plays her bit lips and shy smiles to perfection, as the duo improvise with a penknife, some culinary spoons, a gardening fork and a duck pond. 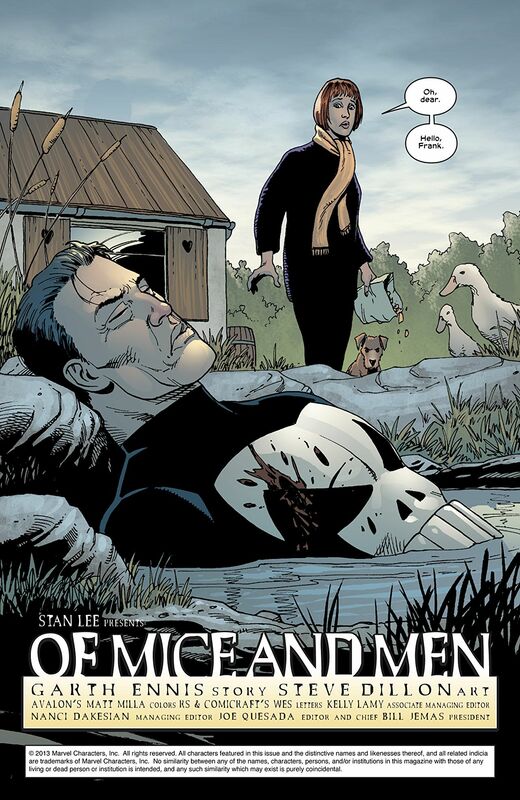 "Nobody writes the Punisher like Garth Ennis - and these brutal tales prove it! When ex-Marine Frank Castle saw his wife and children murdered by the mob, he began a war on crime! So why is he trying to rescue a Mafia don from angry guerrilla fighters in South Africa? And Frank faces off against Wolverine as the two compete to take down a bizarre underworld predator who's cutting off crime at the knees! Plus: Belfast-born Ennis brings Frank face-to-face with terrorism in Northern Ireland. The Punisher investigates a drug ring - and the cops meant to be dismantling it. and does a little dental work in a tale drawn by Joe Quesada! 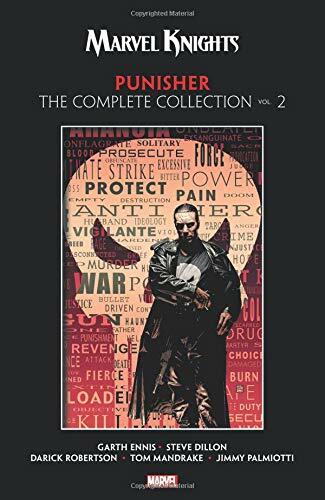 Collecting PUNISHER (2001) #6-7 and #13-26, and material from MARVEL KNIGHTS DOUBLE-SHOT #1.2"